﻿﻿Get noticed! 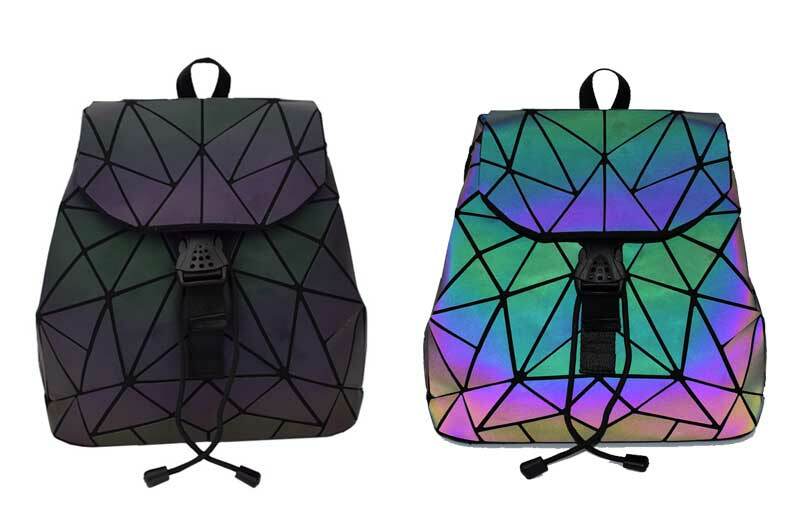 This backpack has patented Luminous Technology that reflects light back in a rainbow of colors! That's a bit wordy, but just remember It's LIT! I get so many compliments. 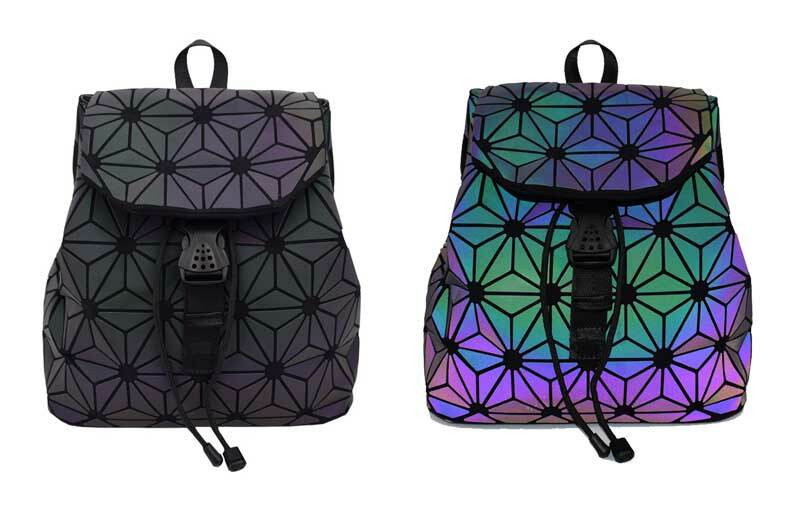 This backpack is so cute! I was a little sceptical when it came in the mail, but it was just like the vids and photos! It looks neon when u take a picture with flash, and with sunlight it has cool colours! It really depends what lighting you’re in. I love this bag! It's a stylish, comfortable, and casual bag, and I wear it everyday to work. It fits in a lot of items and has different compartments to hold smaller items as well. It's safe to walk with it at night, especially when crossing the street because it reflects beautiful bright colors. I get many compliments from others! Ordering and shipping was very transparent and smooth, so I was able to receive my item in a timely fashion. I had an easy fun time with purchasing my bag. I put my Gucci handbags away in their boxes, to carry this bag 24/7. I love it. Its good for school, shopping and more. Love the bag. Friends who've seen it also love it. Perfect gift for self and others. This awesome bag was home delivered well within 2 weeks (in the Netherlands) and its quality truly surprised me! I’m very happy with the bag! Looks exactly like the picture Great material, love the color I love it!!! Super quick shipping and amazing product. Love it! I love it!! Everyone is talking about the bag! And it is for my safety coz' i love touring at night. Fast delivery and it is what's in the description. I shined my camera light on this backpack and it looked like a rave party! Absolutely love this bag, looks amazing, fits more than you think, comfortable to wear and gets so many compliments. Love it! Lots of compliments on it. This is perfect! I waited a bit to see how durable this bag was to write the review. It holds up well on my walk five days a week for my job downtown, it holds up well on the job I work on the weekends in an amusement park, it was great at the baseball game, and I have absolutely no complaints. It holds all my makeup, my full sized hairbrush and a can of sunscreen. The straps stay in place!!! In the event I need to adjust it (for whatever reason), I can easily adjust the straps with absolutely no problem. On top of that, I receive TONS of compliments. Strangers on the street have commented how much they liked it. I like the reflective design. 110% recommend!!! Really cool bag! It is well made and the perfect size. I use it every day. It holds a ton and you can adjust the straps easily to open up more if you need to carry more stuff. The outside pattern is soft and looks awesome with color and when it’s gray. I have gotten so many compliments on the bag and people love staring at it. 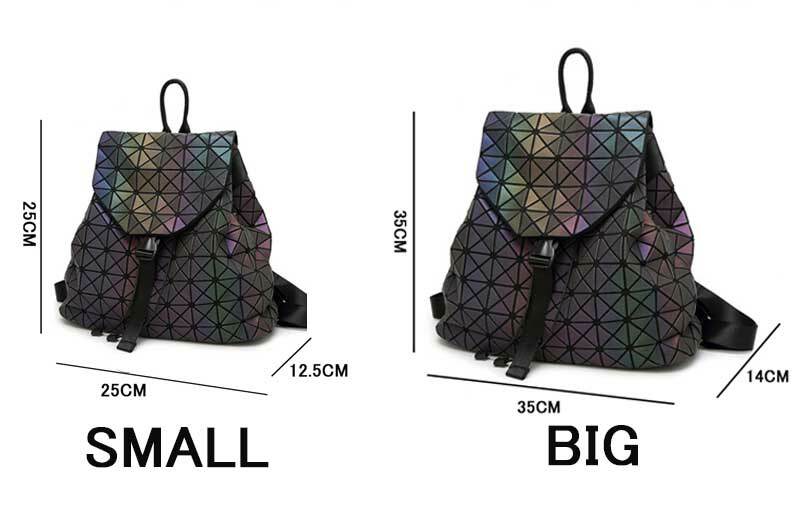 I love the size because I can bring it wherever and not have a huge bag on my back but know I can carry more than my purse holds. Love! Super unique, stylish and roomy, definitely worth it. Not only does this bag look SUPER COOL in and out of lighting, it’s functional! I carried it around the zoo with all our snacks and drinks and it held quite a bit without feeling bulky or awkward. It’s simply an amazing bag! LOVE this bag. I get TONS of compliments on it. It is so gorgeous when the light catches it just right. It holds a ton of stuff and is very well made. I've been using it daily for awhile now and it still looks brand new. Great purchase! It’s so beautiful and I’m so obsessed. I get stopped and asked about it everywhere I go. I’ve given out this link countless times now. Love this bag! 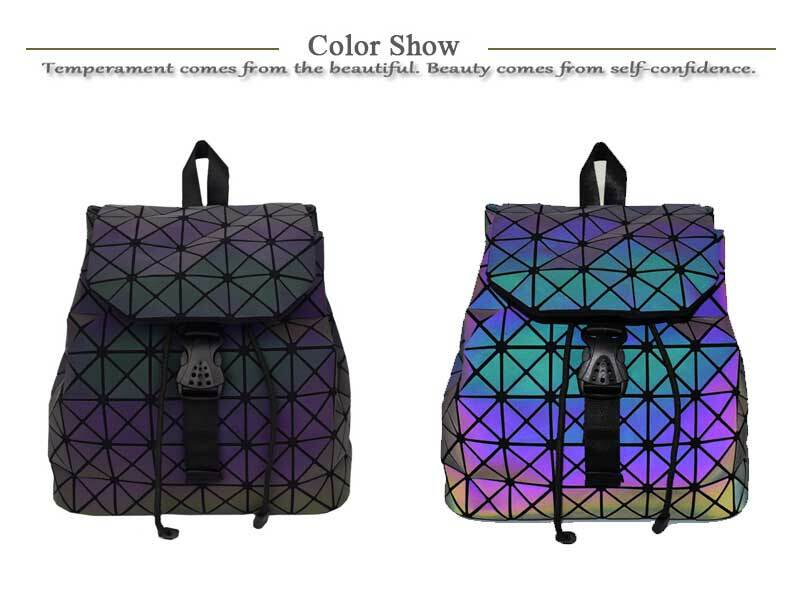 The color, iridescent reflective nature, and pattern of this bag is great and very unique - I get so many compliments. Drawstring and front clip, and small interior zippered compartment make it very secure (I never fear losing anything). And so far it seems pretty water resistant (as long as I don't get any water under the flap, but that's pretty easy to avoid). Love this backpack! It fits a ton and it looks really cool. Bought to use for a road trip and it is a perfect bag to walk around and explore with. Love this bag and get compliments every day! The size is perfect, it’s comfortable and it’s well made. Omg, I love this bag. It's sturdy, super spacious, and water resistant. I'm a pedestrian and bike commuter, so I need a decently sized bag to hold my lunch and book and life, basically. This holds everything I need neatly, without being huge and in the way. I got caught in the rain immediately my first day with it, and everything inside stayed dried and the bag itself was unharmed. Not to mention it's AMAZING to look at! I've gotten so many, "OMG THAT BAG!" comments it's incredible. I get excited about it again every time though. This is for sure my favorite bag. 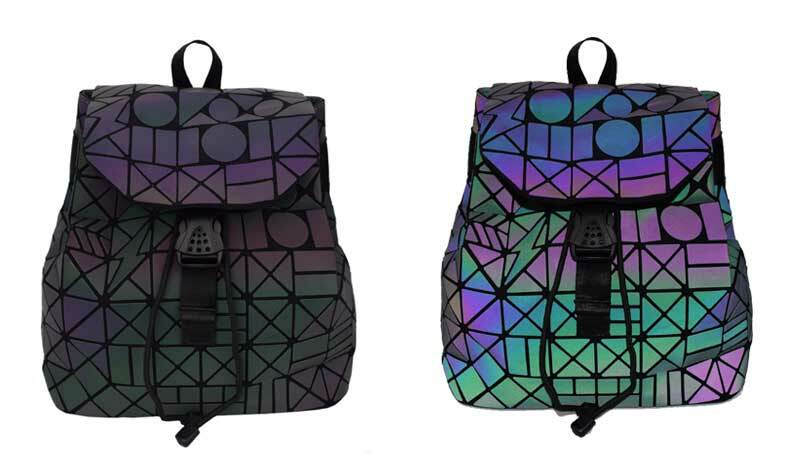 Very nice back pack with excellent reflective properties! Thank you! Mamma mia!!! trip-bag i love it! ABSOLUTELY BEAUTIFUL..I'm getting so many compliments..told a number of people about you..
A fantastic product and exceptional quality. Bought if for my sister for Christmas but may keep it myself! A bag the reflects to light. In my opinion is different. Not a bad different, but a unique different. Definitely not something you see everyday. I am totally satisfied with the product, and I would definitely recommend it to others. Your shop is definitely amazing. Daughter loved the bag, delivered in a timely manner. Good experience. Got them for my daughters for presents and wish I ordered more. Its a fun cute bag for casual days with family. No worries about getting it dirty its pretty dark and wipes clean. 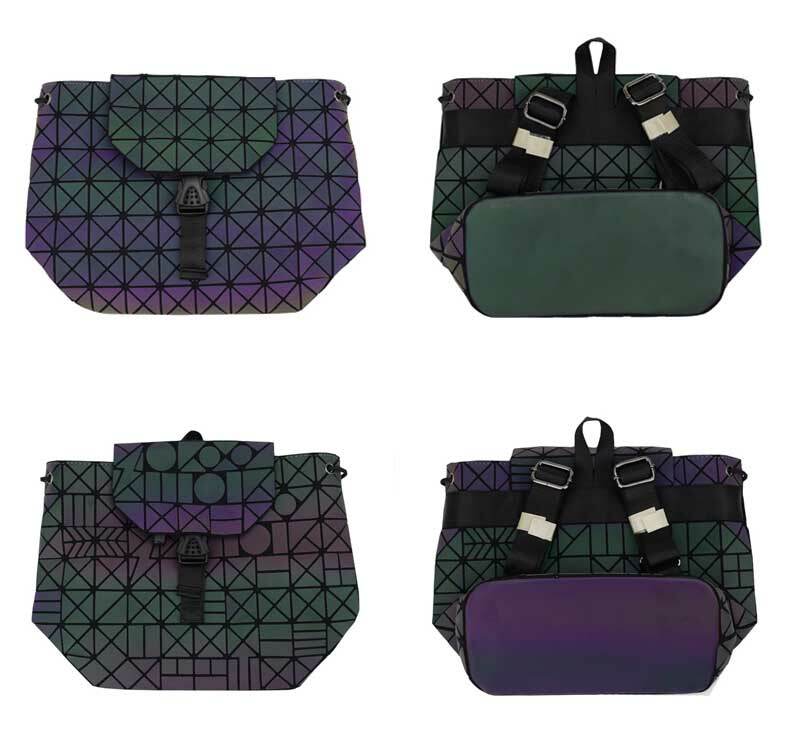 We love the bag and everyone get a kick out of the colors and reflectiveness of those colors. My girlfriend loves the bag. It's replaced her purse and carries everything she needs. The bag is surprising well made. I loved the bag and how quick it arrived. All arond great!! This s is the greatest bag I've ever owned. I use it as a gym bag, it's large enough to fit everything in and it's just STUNNING! Love this bag, used it at a music festival. It held up great, and I got tons of compliments on it! 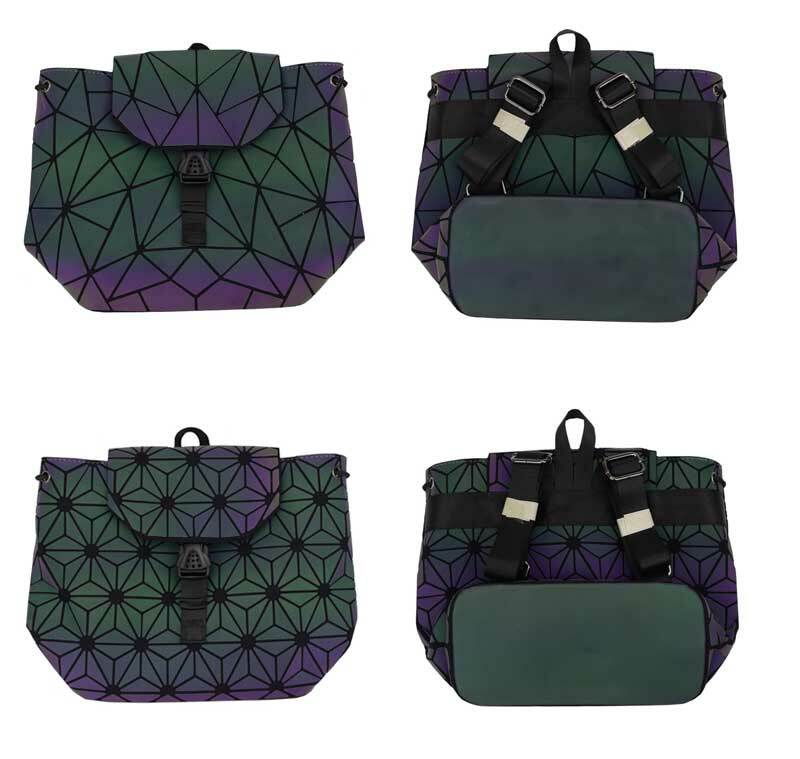 Bought this specially for my trip to Disney, because it matches Spaceship Earth! Totally love it, and getting tons of compliments. Have been referring people to this online shop to get their own!